Comment: I forgot, google is owned by the elite and cant be trusted. Around the middle of March this year 2006, I was at work and called up front to a conference room for no apparent reason. I was greeted by an ethics/detective woman from the corporate office who wanted to ask me some questions. The whole thing reminded me of the scene in the first matrix movie when the 3 agents Brown, Smith, and Jones interrogated Neo and bugged him. Needless to say, there were no smiles the whole time. This meeting resulted in me being sent home from work for 4 weeks without pay. (Nevertheless this has been a severe blow to myself and family). I can only hope my website pulls me through, and I know it will. The only things they asked me about were my website, orgonite, my photos from the field, and gifting. The investigation they did on me lasted over a span of 3 months. I kept on thinking to myself why did this happen to me and what it was all about. Well I got an email from Don the other day who brought the subject of HAARPICANES when a light bulb came on and it all started to make sense. Or did it? I think so. What if they were trying to knock the wind out of my sails prior to hurricane season so I wouldn’t be able to participate like I did last year. But then why me? What had I done in the past that would factor into the scheme of things by the way of hurricanes? Did someone want me out of the game? Then I thought….HURRICANE DENNIS!!! Oh yeah, ofcourse. During each trip to Gulf Shores, we gifted hundreds of tbs, hhgs, and an array of different size cbs. The hurricanes of 2005 started sometime in June, and in July Hurricane Dennis came hurtling towards Gulf Shores full steam! I remember I couldn’t sleep for a couple of days because they estimated this hurricane now a category 4 and would cause damages in excess of $10 billion dollars. As the hurricane approached and made landfall it immediately went from a category 3, then to a 2, and then to a category 1 and dissapated shortly thereafter. Now I’m no hurricane expert, but I believe this was one of the the first times someone started reporting ahead of time about GIFTING a specific area and successfully destroyed a major hurricane (without any significant structural damages) upon it’s arrival! Hurricane Dennis did not cause any structural damage but I understand the flooding it caused cost about 1.5 billion which means WE SAVED THE TAXPAYERS 8.5 BILLION DOLLARS! This was obviously a significant victory for the orgonite gifting movement. Note: What happened in Alabama was directly and indirectly related to efforts from our fellow warriors in the surrounding states who were covering all their bases. 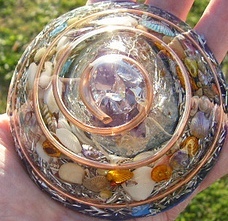 You see everybody’s orgonite connects etherically adding to the significant whole. “We need them, and they need us.” If it were not for them, we would not have been successful! Some of the people who became a force during this time are as follows: Robert Schoen in New Orleans, if it wasn’t for Robert with his gifting and superior cloudbuster skills hurricane Katrina would have been much worse. Robert also made some thought provoking observations of the entire situation which brought to light the truth about the government corruption involved. David Emmett in Barbados who singlehandedly protected this island from destruction in 2005 made several posts with some of the most awesome and detailed reports and a great display of courage to experiment with his cloudbusters in the eye(s) of the hurricane. Jeff Mckinley who’s cbs have saved Miami from megadestruction on several occasions and saved many lives in the process. I remember Jeff deflected a hurricane our way last year like it was nothing. If it wasn’t for Jeff’s and the other warrior’s help, we may have gotten pummeled early on because Jeff absorbed the toughest blows up front. This is just to name a few of our fellow warriors, without their help our efforts would be in vain. This year it will be in our favor to gift off the coast(s) to mitigate or destroy these tropical storms before they come inland. How far out to sea should we go? Well that’s something we will have to decide when we discuss logistical strategies. As the orgonite permeates every nerve, every cell, and every tissue of the earth the natural balance is being recreated and restored.